At one time terrain for wargames had to be created from scratch, with cardboard, plasti-card, insulation foam, even aquarium plants and statues... pretty much what ever you could get your hands on. It was a very creative process, and it still is for those who can. There are those who can, those who can't, and then those who prefer not too. 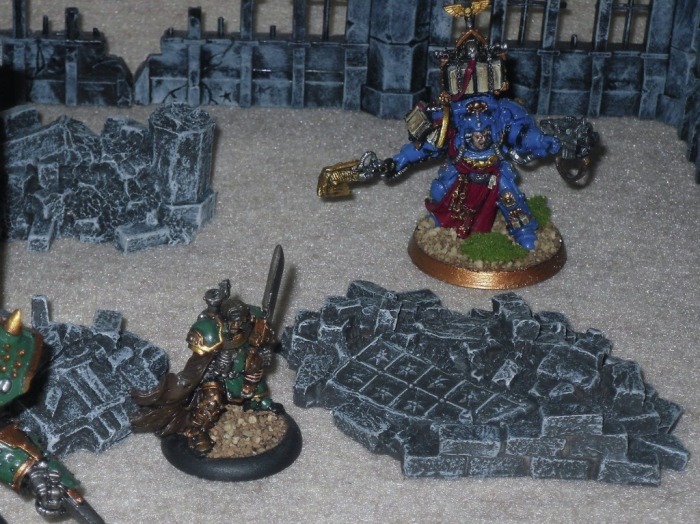 Thankfully these days building a gaming board/terrain table for wargaming can be done by simply purchasing a variety of kits, or even pre-painted and built, totally ready to go pieces if you so choose. 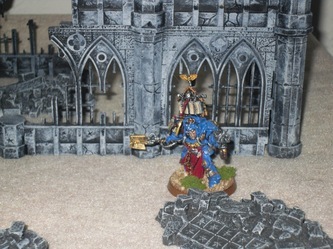 I'm one of those who can, but prefers not to create terrain from scratch, who also appreciates the value in kit, and pre-painted ready to go form both. 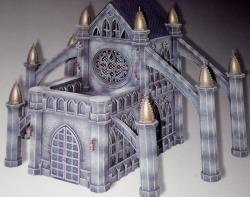 Even GamesWorkshop started to cash in on this recent trend towards kits, with their Gothic building kits of the Imperium. Pegasus Hobbies is a traditional model company, that offers a wide range of products, and is also a brick and mortar hobby superstore in California. 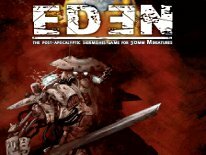 In recent years they've decided to take the plunge, by entering into the wargaming genre, and offering a variety of scenery/terrain products too. First up is the Museum Models Collection. 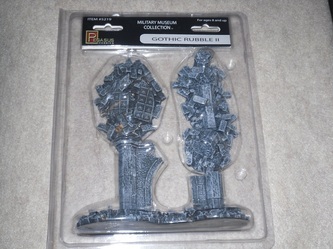 This collection includes a variety of Gothic buildings, trees, rivers, even a few pre-painted and ready to go accessory pieces. 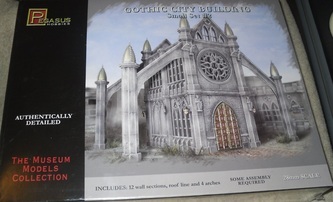 The true break-out pieces of this collection are the Gothic building kits. 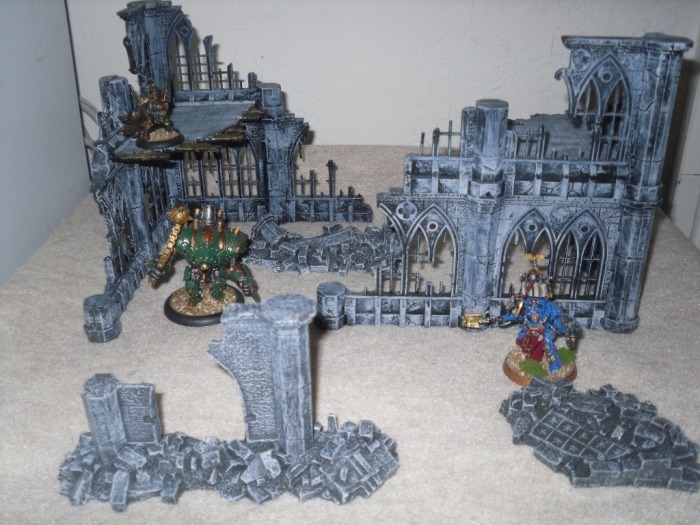 There's no way around it, the only other kits out there to compare these building kits to are GW's Gothic city terrain kits. Visually I'd have to say that these are as good, or better than GW's kits, and in most cases are quite a bit less cost-wise too. The kits we looked at are Gothic City Building Small Set #1 and Small Set #2 which they sent along, and I already owned the Gothic City Ruins #1. Each kit can be totally snap-together as the packaging details, and to make for easier storage, I opted for this method myself. You could glue them together, but I like the means to be able to break them down, and store them in pieces flat. Each kit is made up of gray plastic, and the plastic is quite thick, making these very sturdy, and very durable kits. I foresee this stuff withstanding a lot of wargaming. There's nothing flimsy, or cheap about any of these kits. The nice thing about Gothic buildings is, that painting them is as easy as spraying them primer black, dry-brushing some shades of gray and white, doing some tidying up as needed, then sealing them, and you're all done. These would be great kits for beginner wargame/hobby enthusiasts, because there's nothing at all complicated about them. Granted you could take more time with them, and aim for masterpiece painting quality, but most won't. There's enough detail that if someone wanted to go all out they could though. Little lanterns, torches, even gargoyles adorn the outer facades. It also wouldn't be tough to mod them to include some extra detail, like modeling stained glass, and other ornate details either. Each of these kits sell on average for $25 each online, and the Ruins can be had for less than a $20 bill, which is what I paid for mine locally at full MSRP from a hobby shop, not a gaming store. These are also rather large models for being the Small kits, so it wouldn't take many of these to put together a nice looking city block in no time. I can only begin to fathom how big the Large kit is after having seen these Small ones first-hand. The Ruins detailed in the photos, is the smallest of the bunch too. The other Small sets are so large that I couldn't find an optimal spot to photograph them to do them justice, which is why I opted to use the stock studio photos for them. By design, it looks like you could easily mix and match some of the parts too. With a few kits combined I'm sure you could build some even more interesting creations. Those who are used to making their own terrain, could definitely find a use for these, because with a little bit of creativity, the possibilities are endless. Best of all they're not at all cost prohibitive for most any project. Similar models from the competition cost $5-$10 more per model, on average too. My only complaint is that the non-ruin buildings lack a roof, but this also allows for playing within the walls. This is a small complaint tho, because you could easily get some really nice, fairly inexpensive plasti-card for next to nothing, some of which that's even imprinted with roof tile detailing already. 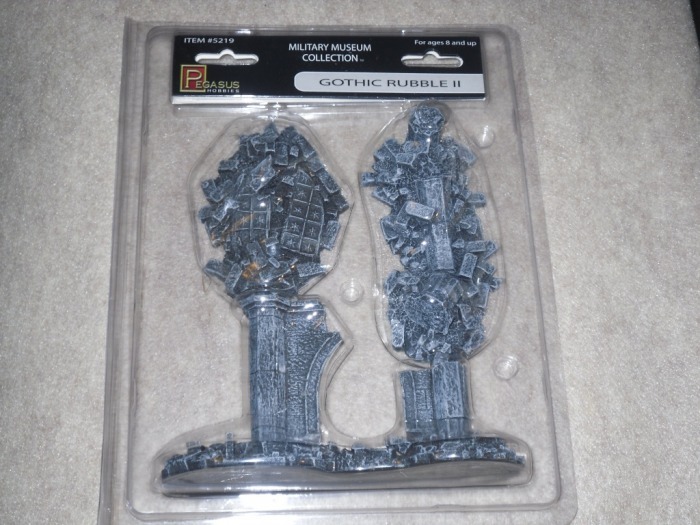 Another one of the products we looked at is the Gothic Rubble II set, from the Military Museum Collection. While this collection as the name implies, is designed to compliment their line of plastic military models, it also works just fine along side the rest of the Museum Model Collection as wargaming terrain. As my photos detail, you can't tell that these are from a different series, they integrate seamlessly with the Museum Model line. 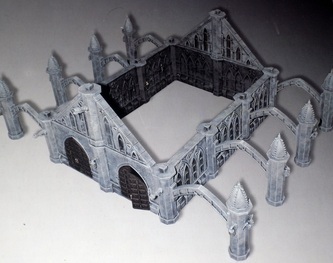 This set includes 3 pieces of pre-painted, and totally ready to play Gothic ruin/rubble. The largest piece depicts partial pillars, with bricks and debris, the other two pieces detail a pile of brick and rubble, and the last is a pillar broken into sections with brick and debris all around. The paint jobs are sufficient too, nothing breathtaking, but again, this is nothing more than some nicely detailed rubble and debris. The pieces are quite heavy too, so they should be able to withstand years of wargaming, Although they're so solid and heavy, that they feel like they might just shatter if you were to drop them on a hard surface from the proper height. This set retails for about $13, which again, for what it is, and considering the set is pre-painted and ready to play, that's a steal. Even at full MSRP of $15, you can't beat it. This last kit I'm covering has been around for a while now, but I still think that a few of these sets look so right for wargaming in general, that they deserve a little more attention. The Chemical Plant Construction Set is truly more of a model than anything, because this set is made up of a whopping 300+ pieces. This is one of the Platformer System series sets that they offer. It gets a little confusing too, because they have the Platformer, Hexagon and SyberClix series of products, all of which look to totally compliment each other. Why they had to name them all so different is puzzling. Even the Hexagon set, doesn't look to be made up totally of hexagons, but there are a few hexagons in those sets. There's a variety of kits in the Platformer series, two of which are ramped platform sets, which allow you to design vertical outposts with ramps, and the other two include this Chemical Plant, and a Power Plant. I always thought that the Chemical Plant looked the coolest, because there are so many tanks and pipes leading all over the place, and it just has a really strong sci-fi, and maybe even steam-punk vibe surrounding it. There's not a lot that defines the scale of it either, so I like that fact that you could probably use it in most any sci-fi skirmish game of any scale, and quite possibly even in fantasy/hero games like Warmachine, Malifaux and Pulp City. The way I see it, the more games you can use something for, the better overall value I feel that piece is. This is definitely one of those products. 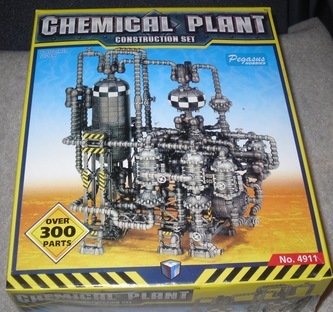 The Chemical Plant retails for on average for $23, making it a really nice piece for under $25. Another thing about Pegasus Hobbies, is that they have good ties with the hobby shop community, through their already existing and established sci-fi, and military model product lines. Most any model-shop/rail-road hobby shop probably already carry some of the products reviewed, since they carry most of their other products already. So they have strong availability at retail, as none of these products are at all hard to find, unless they're simply sold out of them. 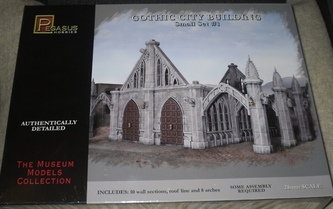 All in all, these are some of the most affordable, and nicest looking Gothic city buildings you can find in kit form anywhere. Even if you already have the GamesWorkshop models, these would stand alongside those seamlessly, and make for some nice additional models to round out any Gothic city table. I'm also impressed by their pre-painted products, all of which make great accessories to help dress up any gaming table, or gaming environment, without draining your wallet dry. They offer so many other model products too, many of which they offer in kit, or pre-painted ready to display form, like a really nice War of the Worlds line, and models from the hilarious spoof on Star Trek called Galaxy Quest, just to name a few. If you haven't checked out the Pegasus Hobbies stuff yet, their stuff shouldn't be hard to find at all.